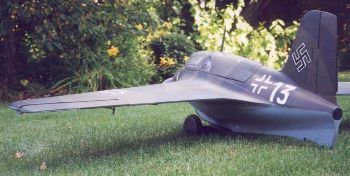 David Archibold's father Bill (from Saskatoon, Canada) built this radio-controlled Komet model, with assistance from David. It is built from Model Airplane News plans. The wingspan is about 60" or 150 cm. It is completely balsa sheeted, and then fiberglassed. They moulded the canopy themselves. 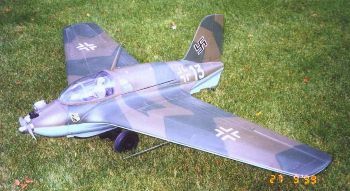 The shape of the model is very realistic as can be seen in this picture. The engine is a .60 size. To get it to fit, the molded fiberglass cowl is a bit too long (necessary to enclose the engine), and on the starboard side part of it had to be cut away. Bill remarked that he propeller will be changed for a larger one. The fuel tank is under the cockpit. The model does not have spoilers. David will use a long enough landing strip. The tail wheel is a bit large and the main landing gear axles etc. are heavy looking so they don't break on impact after they are jettisoned. The model is painted as "White 13" in a splinter scheme of dark green and olive, the pattern coming from the Testors model. The famous "flea" insignia ("Wie ein Floh, aber oho!") of the 2. Staffel of JG400 is on the nose. The last picture shows David holding the model. Note the wheels detached. David notes that the panel lines on the bottom don't seem to show up on the picture. The leading edge wing slots are a nice touch, not always seen on RC models. 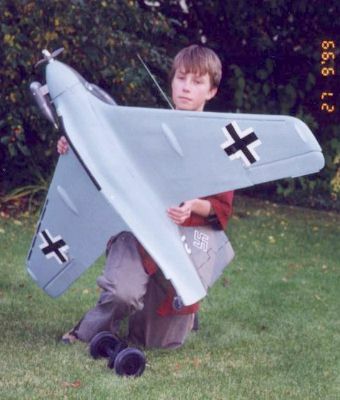 David will do the test flight next spring (2000) since it has started snowing!